Hollybeary Creations : Unforgettable... Friday Mashup! This week Amy is our Hostess and she's asking us to use, Razzleberry, Slate, Pacific Blue together along with a See thru element.. like Vellum, Acetate.. etc. I choose to use a piece of Vellum as an overlay. I'm also using the current sketch at Freshly Made Sketches again.. This is a great sketch to keep in your Sketch Book! 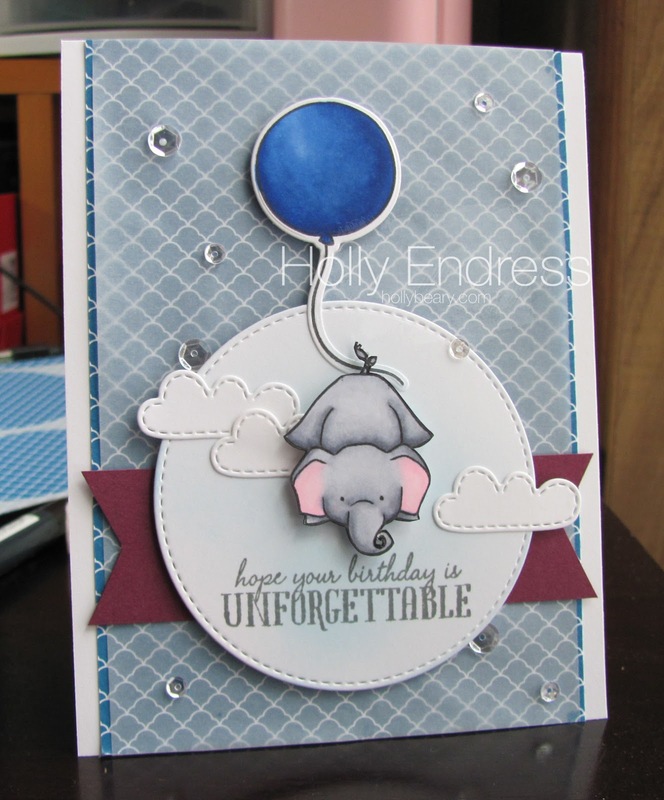 I created a white card base and then I added a layer of Pacific point DSP from Stampin' UP! and then I added another layer of vellum trimmed just a bit shorter on each side. I really like how the vellum changes the blue to a soft grey almost. I die cut a piece of white using the MFT Stitched Circles Stax and then I stamped the sentiment from the WPlus9 set Unforgettable using some SSS Slate ink. I used some Mama Elephant Pacific Blue ink to create a blue background with a Sponge. Then I added some Clouds that were die cut from the Lawn Fawn Hello Sunshine Die set. 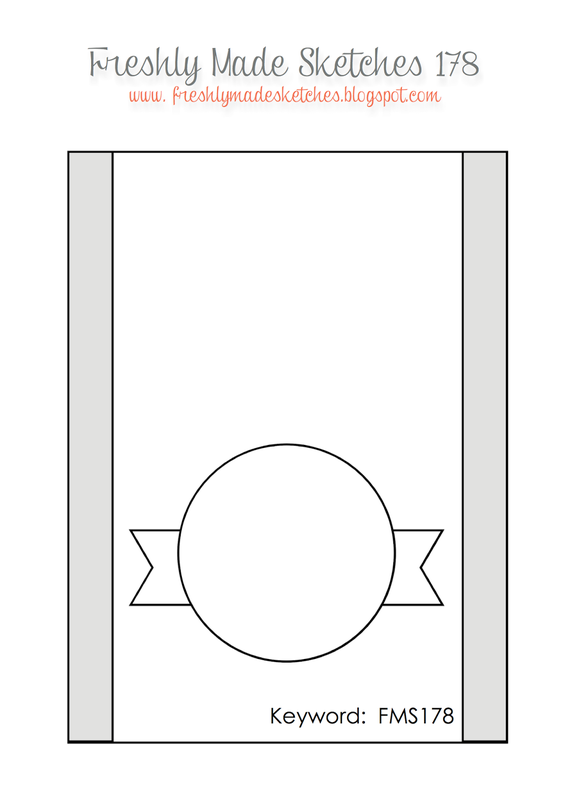 I created a banner with some Rich Razzleberry card stock and adhered the vellum behind that and attached the banner right to the card base and then I added the circle piece with some dimensionals. 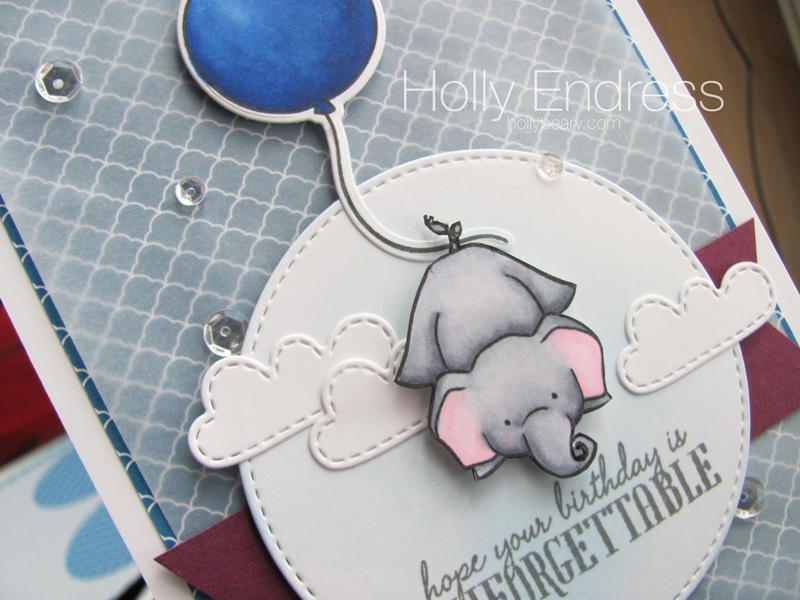 I stamped the elephant and balloon onto some white card stock and colored it in with Copics and cut them out. I adhered them with some more dimensionals. To give the vellum some more adhesive I added some Sequins from Pretty Pink Posh randomly and added some adhesive directly behind the sequins as well to hold the vellum down. This came out really cute but I just realized I forgot the little hat I die cut, Geez! Be sure to head over to the Friday Mashup blog and see what the other Design Team members created this week! So cute! Totally love it! Oh My, this is adorable. The little clouds and the elephant are so cute. Love the layout and placement of your items. Great team card this week! This IS so cute and worth the wait!! I love how you layered the vellum over the bold pacific point...changes the look so much. The elephant is too cute! Love the coloring...the clouds..